Major General Bobby W. Hodges enlisted in the U. S. Air Force in June 1953. After primary, basic and advanced pilot training, he spent two and a half-years at Misawa Air Force Base, Japan, with the 4th Fighter Interceptor Squadron. While stationed at Misawa, he was a member of the 4th Fighter Squadron Rocket Team flying F-86Ds. In Far East air force competition, the team placed second and General Hodges tied for first place in the individual category. In September 1957, General Hodges became an air technician with the 147th Fighter Interceptor Group stationed at Ellington AFB in Houston, Texas. He served in a variety of command and staff positions and in January 1967, he was named deputy commander for operations and base operations supervisor. In July 1968, General Hodges began a 90-day voluntary tour of duty in Southeast Asia. He participated in the "Palace Alert" program of the Air Force, a program using Air National Guard pilots flying F-102 interceptor aircraft in Southeast Asia. During his tour of duty, General Hodges flew 51 combat missions out of South Vietnam and Northern Thailand for a total of 101 combat flying hours. In May 1969, he assumed command of the 147th Fighter Interceptor Group and under his command the unit carried out its air defense mission of the upper Texas Gulf Coast in an exceptional manner. He also assumed command of Ellington AFB as an additional duty when the Air Force closed out its host base responsibility in March 1975. He continued in this dual role until his reassignment as commander of the 136th Air Refueling Wing, Texas Air National Guard, Hensley Field. Under General Hodges' command, the 136th Air Refueling Wing accomplished two significant deployments to the European theater. During those deployments, General Hodges was cited for outstanding leadership as the wing accomplished 356 tactical airlift employment sorties, carrying 701.6 tons of cargo, 2,056 passengers and dropped 1,374 paratroopers with no safety deviations. 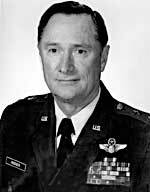 On 14 June 1984, General Hodges was selected to be the commander, Texas Air National Guard with headquarters at Camp Mabry, Austin, Texas, and served in this position until 1 December 1984, at which time he was assigned as the Air National Guard Assistant to the Commander-in-Chief of the Military Airlift Command, Scott Air Force Base, Illinois. In this capacity, General Hodges functioned as the liaison officer between the Air National Guard and the military airlift command until his retirement on 31 December 1989. General Hodges is a command pilot with over 7,400 flying hours, of which 4,250 hours has been flown in single-engine jet fighter aircraft. His decorations and awards include the Legion of Merit, Meritorious Service Medal, two Air Medals, the Vietnam Service Medal, the Lone Star Distinguished Service Medal and numerous other Federal and state awards. General Hodges is life member number 92 of the National Guard Association of Texas. He served on the board of directors of NGAT for three years (1967-1969), and is a charter member of the Texas Guard Legislative Task Force. General Bobby Hodges is truly a dedicated patriot and citizen-soldier who for more than 44 years has provided outstanding leadership and distinguished service to his state and nation.